Laptops have always been tempting targets for thieves, never more so than when you take them abroad with you. But what can you do to enhance laptop security? The most basic hardware security option for your laptop is a rugged case. It’s best to pick a case which is not obviously that of a laptop, however, so that potential thieves won’t know what’s inside it. If they think the case contains nothing but papers, they are more likely to leave it alone. For this reason, it’s usually best to avoid fancy cases bearing manufacturer logos. The scale of laptop theft is such that biometric security options – typically fingerprint scanners – are now being included in many new laptops as standard. If you are purchasing a laptop specifically for use abroad, it’s an option you should definitely consider. Integrated iris recognition devices also exist, but tend to be more expensive. Security tokens are another hardware option. These usually come in the form of USB tokens - although other form factors exist, too – and operate like dongles, preventing vital computer operations, like logging in, or accessing important data, from taking place unless the hardware token is connected to the laptop. Obviously, the idea is that you take the token with you when you are away from the laptop, rendering it almost useless to anyone who steals it. Hardware security options are the most obvious way to guard against laptop thieves. But there are software options, too, which are not to be sneered at. Some of the software security options you can implement are rather sophisticated. For example, if your laptop is equipped with a webcam, some theft-guard software will automatically take a photograph of anyone who approaches the laptop and upload it to a safe online location. That way, if the laptop is stolen, you should have a nice new mug shot of the perpetrator available to help the police with their inquiries. 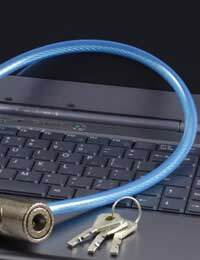 Even very simple laptop security software can be effective. For example, there are applications which will emit a very loud noise if the laptop is unplugged or there is any attempt to shut it down. If worst comes to worst and your laptop is stolen, using a laptop tracking service can help you get it back. These are generally subscription-based and use hidden software to identify the location of the laptop once you report it stolen. Some services use GPS, while others detect the IP address of your laptop once the person who stole it connects to the Internet. Using this information, the police will then be able to get detailed address information from the perpetrator’s Internet service provider. In some cases, the thieves will be able to bypass the hidden detection software by removing the hard drive or re-installing the operating system, but the most secure services embed the code at the firmware level, allowing it to survive even this. Some of the tracking services can even remotely delete important data from your laptop once you notify them of a theft. A few offer money-back guarantees if they fail to recover a stolen laptop. If your laptop contains sensitive data, whether business-related or purely personal, you should take additional steps to secure it. That means, above all, encryption. Some operating systems will give you the option of encrypting some or all of the contents of your hard drives. Otherwise, you can use third-party software to accomplish the same goals. Some will even render encrypted directories invisible, so that thieves won’t even know they exist. Laptop theft is a serious problem, particularly for those working abroad. As the article demonstrates, though, a wide array of security measures now exists to help cope with it.